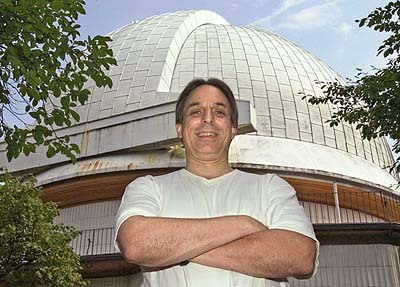 Artie Hatzes is an American astronomer who works as a professor in Germany. For many years prior, he worked at McDonald Observatory, collaborating with Bill Cochran on searches for extrasolar planets. Artie still frequently collaborates with McDonald Observatory astronomers. Born in Havre de Grace, Maryland, Artie Hatzes' family moved to Fort Worth soon after. His family's background is Greek â€” Artie's father shortened their name from Hatzigeorgios to Hatzes. Artie enjoys a fishetarian diet, eating lots of fruits and vegetables and fresh sushi. He also loves to sail, bike, and stay fit. When not observing, he says he greatly enjoys being out on the open surf. "I'd rather be sailing," he says. While at the telescope at night, Artie says he likes to listen to loud rock and roll, and he drinks coffee to stay awake.